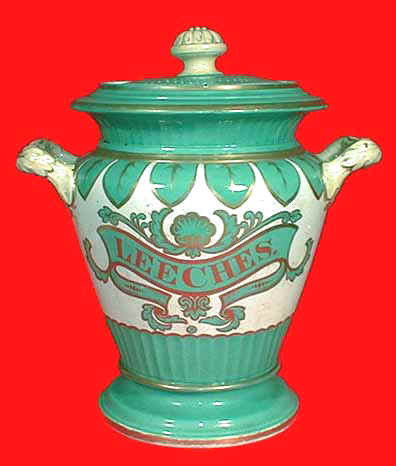 A fine and decorative c. 1830s Staffordshire pedestal-type leech jar. The jar is large, having a 10 inch diameter at the rim…nearly 12 inches at the handles…and standing 15 inches high. 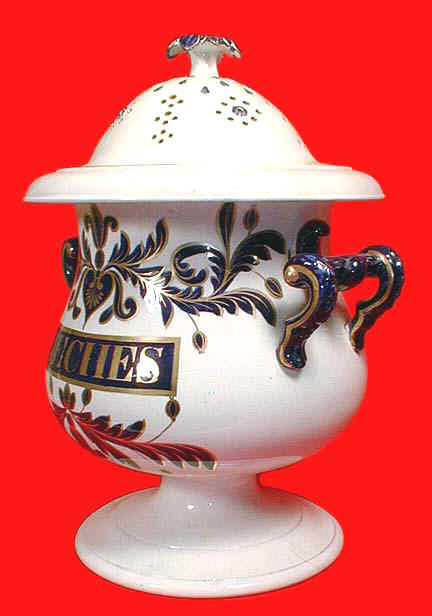 The handles are more delicate than the typical jar of this form as seen in Bennion and Crellin. The underside of the base is impressed: M. TOMLINSON / HULME. Crellin, Medical Ceramics in the Wellcome Institute, p. 129, states that this is the mark of a wholesaler in Manchester. Godden, the expert on British pottery, lists a Tomlinson as active from 1801-1834. The original decorative flourishes and lettering are superb and have strong color and applied gold. This is a most desirable bloodletting artifact and a magnificent display piece. 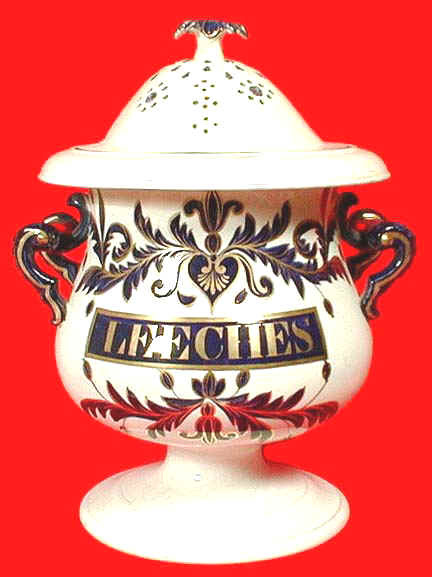 Another of the collectible 19th century Staffordshire leeches jar is the vase-shaped container. Though oftentimes unmarked, this example does have the raised seal of ALCOCK over a beehive on the underside of the base. Samuel Alcock & Co. was in business from 1830 to 1859. The Alcock jars are found in blue, yellow, and burgundy, besides the green shown here. See Crellin, Medical Ceramics in the Wellcome Institute, p. 129-131 and fig. 142.